We want your party to be perfect! Here are a list of Frequently Asked Questions about our parties. Do I have to book a party in advance? Yes, we routinely sell out on weekends so we suggest you make your reservations as far in advance as possible. Is my birthday deposit refundable? Birthday party deposits are not refundable. We will transfer your deposit to another date if you reschedule 48 hours in advance. Can I bring in outside food or drinks? No, we do not allow outside food or drinks to be brought in the facility, except the cake. Can I bring icecream? 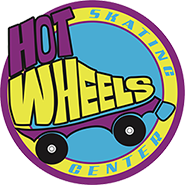 NO, icecream (or icecream cakes) are NOT allowed at Hot Wheels. Can I bring a cake in if I do not have a birthday party booked? No. We do not permit any outside food or beverages to be brought into the facility. Are Skate Mates included in my party package? No, skate mates are not included in ANY party package (including private parties) and must always be rented as a separate fee. Can I reserve Skate Mates? No, we do not allow parties to reserve "skate mates." They are available on a 1st come, 1st serve rental. Can I bring my own skates? Yes, you may, however; we do NOT allow "heely" shoes on our skate floor.